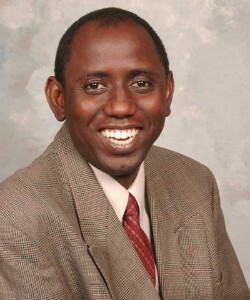 Abba Gumel is a mathematician, academic, and the C. Castillo-Chavez Professor of Mathematical Biology at Arizona State University. His main research interests are in mathematical biology, nonlinear dynamic systems and computational mathematics. Gumel received B.Sc. and Ph.D. degrees from Bayero University (Kano, Nigeria) and Brunel University (London, England), respectively. He was a full professor in the Department of Mathematics, University of Manitoba, before becoming the C. Castillo-Chavez Professor of Mathematical Biology at Arizona State University in 2014. Gumel became a fellow of the African Academy of Sciences in 2009. He was made a fellow of the Nigerian Academy of Science in February 2010. He received the 2009 Dr. Lindsay E. Nicolle Award for excellent paper published in the Canadian Journal of Infectious Diseases & Medical Microbiology.